Yankees pitcher Dellin Betances appears to be extremely slow to the plate, and seemed to be throwing a virtually uninterrupted string of breaking pitches, two factors that encourage base-stealing. Still, this is awesome: Pillar gets second and third without a throw, and then takes off for home before Betances has even started his windup, basically daring the pitcher to beat him with an accurate throw. 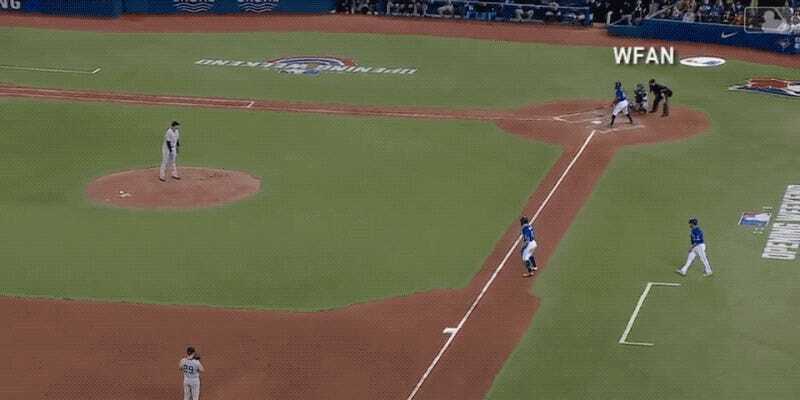 The throw is nowhere close, and Pillar glides in standing up. That it happened at all is pretty neat. That it happened against the Yankees is just wonderful. What The Hell Is John Sterling&apos;s Home Run Call For Giancarlo Stanton?